Steve: Welcome to this podcast today. 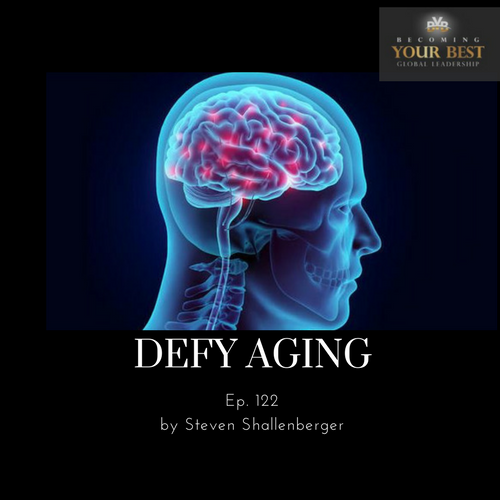 This is Steve Shallenberger with Becoming Your Best and this is one of the most important podcasts that I’ve done. The subject today is on defying aging, or health and longevity and becoming your best and how these come together. So, we welcome each one of you today. I’m going to focus really on principle number eleven of the twelve principles of highly successful leaders from Becoming Your Best, and that is live in peace and balance. Now there is a direct correlation to living in peace and balance and defying aging, health and gaining greater longevity. Now there’s good news and bad news so which one do you want first? Let’s take the bad news and get it out of the way. Well, from fifty years on, here’s the bad news; your brain loses 0.5 percent of its mass or capacity every year, from that point and it continues to decline. This has a direct correlation as our brain decreases in size particularly our hippocampus; and we’re going to talk about this a bit later, which is the gateway to the rest of the brain and as it does then health can deteriorate in other ways as well. Now if certain conditions exist, that decrease in the size or capacity of our brain particularly in the hippocampus can be 5 to 20%. It can be huge! That’s the bad news. That’s the physiology of things and then of course, there may be a predisposition to certain diseases, but also lifestyle has a tremendous impact, maybe as much as 70% in some cases. Of course, there are exceptions to that. All right, so that’s the bad news. What’s the good news? The good news is you can grow the size or capacity of your brain from age 50 on. This can be done by certain things that you do. You literally can defy aging by certain things that you do. And this is the good news. So, this is at the heart of living in peace and balance. Although our principle number eleven of the twelve principles of highly successful leaders is very important, I wish to re -emphasize that although each one of the twelve principles is critical to our success, both on the short term and long term alone, they are insufficient to help you Become Your Best in your personal life with your teams , in relationships and with your organizations that you lead. The greatest result comes to you when these twelve principles work together, and they create a rare chemistry of excellence. It’s like a secret formula that produces an extraordinary and remarkable and sustainable result. So today as we focus on number eleven, I wish to share with you experiences that I’ve had with four individuals that have changed my life and hopefully some of this information will be helpful and impactful for you. The first one took place thirty years ago with the doctor Russell Jaffe, an amazing researcher, MD and he talked about the parasympathetic nervous system and the sympathetic nervous system. Now let me just give a very brief background on this. The sympathetic nervous system is one of the three main divisions of the autonomic nervous system that we have; that every single one of you has and I have. So, here is the impact of each one. The autonomic primary process of the sympathetic nervous system is to stimulate the body’s fight or flight response, in other words it’s the sympathetic nervous system or the “bang” when you need to do something it kicks in. What’s interesting is, some people are in a constant crisis mode or they have an endless list of to do things and the stress is very high in their life and so they’re always using the sympathetic nervous system which if you do not regenerate your body’s capacity to use this high energy battery, then it can end in ill health, a nervous breakdown etc. So that’s where the parasympathetic system comes in and this is the one that stimulates your body to feed, breed, to rest and digest, to recharge itself if you will. Both in balance; your sympathetic nervous system, parasympathetic nervous system is important to your long-term health. So, being aware of that, one of the things that you can do to re charge your parasympathetic system – well, it really comes down to rest and meditation is what doctor Jaffee taught us at a YPO University some 30 or 35 years ago. We had as the attendees. It was a closed session and so there are about 50 individuals that were able to attend. He took us through a meditation process. We laid on the ground, we closed her eyes, we got into a relaxation state and then went in to our inner selves as what he described. This is all based on huge research, medical research and psychological research as well. When you arrived at this inner self, he’d have you go to one of three places in this total state of meditation; relaxation of your inner healer, your inner self-awareness or your inner counsellor. There you take the concern that you have and, in this state, this peaceful state, you have a chance to find peace and resolution, ideas – Oh, my goodness! It’s one of the most amazing things that I’d ever done! We didn’t take long in this state, really. It was 5,10, 15 minutes and we were back out, but the result was quite extraordinary. We’re going to talk more of experience with three other individuals that builds into this. The basic idea here is that it’s important that we take time to build our para sympathetic system to recharge ourselves so that we have great capacity at the sympathetic nervous system when it needs to kick in, we’re ready. This is what preserves us over the long term. This is experience number one. Now, experience number two, happened just a couple of months ago. All these last three are all recent and just in the last 60 days. What an extraordinary experience for me! I had the chance at what is called a retreat, a form retreat, and with the friends; my form mates who are amazing people. We had doctor Mao Xing Ni come in who is from Santa Monica, California. He is a 37th generation, from his family, healer if you will. His dad is currently 101, in terrific health and Dr Mao shared with us his ideas, suggestions and experience on how he’s treating his patients and his background is both an MD, researcher and studied in Eastern medicine. I love his background. So, here are some of the things that Dr Mao talked about how to extend our longevity, how to maximize our health. I’m going to share a book from Dr Mao in just a moment. ” Don’t drink water or liquids three hours before going to bed. This will help improve your sleep and sleep is critical for long term health. ” Fast every single day 12 to 14 hours, so from your last meal at night to your first meal in morning because, eating creates a major stress on the body. His recommendation on the eating and I’ll go a little bit further of this, is to stop eating before you get full. So over eating puts huge stress on our bodies and fasting 12 to 14 hours allows our bodies to reset. Great recommendation! ” Use sunscreen. These are all things that extend our longevity and if you go on Dr Mao’s website, you can take a little health assessment of longevity. This is what we are given the opportunity to do and there’s certain things that you can do that extend that longevity. He gave us through algorithms that he is developed, health algorithms, how long each of us with would live under our current living habits, if you will. These are things we could do to extend that longevity and health. ” Eat regular versus irregular meals; with a focus on getting proteins from a plant-based diet (beans, legumes, nuts, seeds). Nuts and seeds will give you four and a half more years of life. Dr Mao recommended to eat meat sparingly. ” Enjoy going with the flow on things; so, maximize the efficiency of the energy you use to get the best outcomes. By maximizing the flow of your energy with others energy to accomplish successful outcomes, this gives you a more relaxed and focused attention on things. Especially avoid the obsessive drive to accomplish something. This is a little hard to balance sometimes. So, it’s learning to get into the flow of your greatest energy. I would add that when we say, “Live in peace and balance,” that we avoid things that create conflict and stress in our lives, that we do what we can to effectively resolve those. Rob and I just finished a series of podcasts on the transformation challenge. That’s exactly what that’s designed to do is to focus this getting into the flow of a healthy way of solving problems and resolving conflict. ” Focus on both the journey and end destination. Enjoy the journey. Another one that he shared was an experience. He talked about a very successful friend of his who set a goal at the age of 27, to be financially independent by 30. So, he set the goal and he was well into it. He gave everything he had to make this happen and he was achieving his goal, but he had a major break down when he was 30. ” Be thoughtful in our goals. What is our life’s purpose? Make it meaningful. Make it balance so that we can retain our health, our energy, our longevity, our happiness and these things then can be manifested in a vision. ” Smoothies are great for our health. Especially using plenty of fibre; grapes with skin, pineapple, kale, spinach – these are all very healthy. ” As Dr Mao talked about brain health, according to some significant longevity research, reading books will extend your life by three years. So just think of these two tips so we’ve given right there that seven years increase longevity. Of course, regular visits to your doctor and paying attention to certain of your stats that affect and can be a predictor of your health. Here is another one that he talked about and we will see this is a recurring theme and then I’d like to make a point of this in a moment. Dr Mao asked is there a target recipient that you desire to make a difference with? Children, or sick children, a disease, your family, entrepreneurs, people trying to help people improve, these are all great ideas. Now I’ve just had a very quick list high point of some of the ones that I liked out of the much larger list that I had. Dr Mao Shing-Ni wrote a book called “Live Your Ultimate Life,” so you can find this book on Amazon. I highly recommend it. He’s an outstanding individual. The third out of the fourth person that I’d like to talk about is Dr Oz. I had the opportunity to be together with him about a month and a half ago. In summary he talked about this very same subject and discussed what are the biggest five life adjustments that you can have, that will help us have increased health and greater longevity and he pointed out that we control more than 70% of how well and how long we live. Here are the five life adjustments Dr Oz recommended. 1. Keep your blood pressure at a reasonable level. Ideal is 115/75. 2. Exercise thirty minutes daily. 3. A healthy diet that’s easy to love. In other words, and very much like a some of these others that we’ve just heard, a healthy diet that’s easy to love that you can enjoy over a long period of time. 4. Stress control and Sleep. Each one of these is important. We’ve alluded to a little bit here. Dr Oz has reemphasized this to our control our stress and the amount of sleep we have. Ok, well there’s three out of the four. We’ve had fun so far in this podcast talking about things that you can do to defy aging and your longevity and health. So, what can you do to really make these things a part of your life? Well one of the recommendations I have and that I found is that when people are living the 12 Principles of Highly Successful Leaders, in other words, The Principles of Becoming Your Best, these are the results, it’s a predictable result that you’ll have greater happiness and that you’ll defy aging. It’ll help you, of course in all of the areas of your life as a leader but particularly since we’re talking about this today, there’s a huge correlation and these 12 principles are based on 40 years of research and so as I listened and studied more about health, defying aging, longevity; the more I realize that learning about mastering and sharing with others these 12 principles helps one achieve that goal – to defy aging, to have greater health and longevity. So, whether it’s Dr Jaffe, Dr Mao, Dr Oz, and the next one to come after this little break, Dr Fotuhi, in others the research is deep and solid. So, the twelve principles of highly successful leaders allow you to do this to put into practice the things that they teach and talk about. We’re going to hear from Dr Fotuhi next. He states practice makes cortex. Well how true! So, one of the greatest things you can do, actions you can take right now is to invest in a Becoming Your Best book. You can get this on Amazon, through our website becomingyourbest.com This is an investment that can change your life, and so not only does it help as a leader to be a highly successful leader but one of the impacts, the predictable results, is improved health, to improve longevity. The more I listen to these individuals I just thought to myself, if someone is working on the 12 principles; this is the default of what will happen. Simplicity does not mean superficiality. In other words, these things are not superficial in any way they run deep in our lives. Well let’s get back to our podcast and finish up with my experience with Dr Fotuhi. Recently, just about 10 days ago I returned from Singapore where I had the opportunity to meet Dr. Fotuhi. What an amazing fellow! He went to medical school at Harvard Medical School – that’s where he had his medical training. He was a refugee from Iran in his early youth and finally made his way to his passion which is to help people and in the medical field. While he was a student at Harvard Medical School, as a junior, they asked him to be part of the staff. His focus was neuroscience and today he is associated with John Hopkins Medical Center and continues to teach at Harvard Medical School. He was a great resource here at the global leadership conference that we attended. He is the one that really talked about this whole idea of the good news, bad news and talked about the brain and the health of the brain and essentially, he talked about the cortex as he held up a brain. He said the cortex is the key to long term memory and then he showed us the hippocampus, and that the hippocampus can be observed – you can take pictures of it through a scan and look at the size of it you can see this. A healthy hippocampus literally affects the success of the brain in all areas, so you can grow your hippocampus. It can be reduced in size or grown, and this is the gateway, if you will, to the cortex and it also consolidates information and deletes what’s unnecessary. Now this is where Dr Fotuhi indicated that from 50 years old on the brain reduces in size about 5.5% and continues until we die – that was the bad news. And there are certain things that contribute to reducing the size of the hippocampus and then therefore contributing to our ultimate bad health and demise. For example, here are some of the factors that really cause our brain to reduce its capacity in health and size and this is directly related to the size of the hippocampus. Here are some of the factors that he indicated will affect this and can magnify the decrease of the size of the hippocampus from the age 50 on or even earlier than that. Diabetes does, obesity, sleep apnoea, head trauma and therefore being so a preventative and thoughtful in terms of a sports that may create head traumas important. Depression, stress, Alzheimer’s disease – all these things affect our hippocampus and literally affects who we are. The good news is we can grow our brains and so what are the things that you and I can do to grow our brain? This is a physiological thing. It can be measured. So here are the things that he suggested that we can do. 4. Learn new things – whether it’s learn a language or learn how to play golf. All these things show that it increases the size of the hippocampus. By the time that he finished his lecture, that is when I sat back, and I said if a person literally is working on these 12 principles, these things are the result so let’s just think about these. If they’re part of your vision, in other words, I am a fit individual, I live a happy and fit life. How about this one – I eat a healthy diet! These are all things can be part of the vision. I actively learn. I’m a veracious learner. I take time to sleep well. In 4% of the cases, it’s been demonstrated that individuals can live on four hours or less of sleep – well that is if the other 96% of the population try to do that, then they are going to get sick. So, all four of these individuals indicated sleep is a critical part of our health; 7-8 hours of sleep a day or whatever you need, you’ll get the feel of it, but you’ll feel a certain way, and then you be able to receive the benefit. So that’s part of our vision. I take time to take care of my body, I meditate, and I have a purpose. So, as you develop your vision, this is lead with the vision – principle 2 of Becoming Your Best. Principle 3 is, I manage with the plan. I have smart goals for this year, for every year in the future, but this year around my various roles – self, spouse, partner, parent professional, a civic or service to others so these are examples. What’s the most important thing you can do this year? How about in this area? Well personal is – I take time for exercise. I sleep seven to eight hours of sleep a night – these are specific smart goals. Then the bring it all down where the rubber meets the road, its pre-week planning. In another word principle 4 is to prioritize your time. Well how do you do that? Well one of the best ways we’ve discovered is through this tool or process a pre-week planning – taking a few minutes during the weekend and then thinking in terms of your roles as you look at this next week and what actions can you take are the things that matter most. And then you blend this in with your calendar in a way that you’re able to achieve these things. This is how it becomes a reality. So, I’m just giving an example of 3 things that you can do from these 12 principles that we’re reminded of – in principle 11, live in peace and balance, so that’s what this podcast has been about today. These four experiences that I’ve had with Dr Jaffe, with Dr Mao, wonderful individual, Dr Oz – so amazing that is willing to give all these thoughts free that I talked about with Dr Oz on his website and then of course, Dr Fotuhi, you can go to YouTube and see some of his clips. They’re inspiring, they’re encouraging, they give you hope and last of all however are these are things that you can specifically do. One of those is invest in Becoming Your Best, The Twelve Principles of Highly Successful Leaders – just systematically go through them and work on one a week. It’s really that simple and as you apply them, you develop your own personal vision – now you become directed from within not so much from without and you have a very specific focus in your mind now is filled with the things that create this type of success. Then pre-week planning so these are a few things that you can do. Dr Fotuhi, wow, great! So clear about this, so enjoyed having that. So, these are a few ideas of things that you can do to defy aging, to improve your health and your longevity. This is Steve Shallenberger with Becoming Your Best, wishing you a great day and reminding each one of you and I that you can make a difference in your life and the lives of others. as you do these things thank you and have a great day. THE INFORMATION PRESENTED IN THIS PODCAST DOES NOT REPLACE OR SUBSTITUTE FOR THE SERVICES/COUNSEL OF TRAINED PROFESSIONALS IN ANY FIELD, INCLUDING, BUT NOT LIMITED TO, MEDICAL, PSYCHOLOGICAL, OR THERAPEUTIC. YOU SHOULD CONSULT A LICENSED PHYSICIAN IN ALL MATTERS RELATING TO PHYSICAL OR MENTAL HEALTH. NEITHER WE(BECOMING YOUR BEST GLOBAL LEADERSHIP) NOR OUR PARTNERS, OR ANY OF THEIR AFFILIATES, WILL BE LIABLE FOR ANY DIRECT, INDIRECT, CONSEQUENTIAL, SPECIAL, EXEMPLARY OR OTHER DAMAGES THAT MAY RESULT, INCLUDING BUT NOT LIMITED TO ECONOMIC LOSS, INJURY, ILLNESS OR DEATH. YOU ALONE ARE RESPONSIBLE AND ACCOUNTABLE FOR YOUR DECISIONS, ACTIONS, AND RESULTS IN LIFE, AND BY YOUR USE OF THIS SITE, YOU AGREE NOT TO ATTEMPT TO HOLD US LIABLE FOR ANY SUCH DECISIONS, ACTIONS OR RESULTS, AT ANY TIME, UNDER ANY CIRCUMSTANCE. THE THOUGHTS, IDEAS, AND RECOMMENDATIONS DIRECTLY PROVIDED, OR INFERRED, IN THIS PODCAST ARE NOT PRESENTED BY A MEDICAL PROFESSIONAL, THEREFORE THEY SHOULD NOT BE INTERPRETED AS SUCH.